Like Vern Buffey, Bruce Hood, Ron Finn and Ray Scapinello before him, Kerry Fraser is leaving the ice as an official and heading straight to the bookstore shelves as an author. 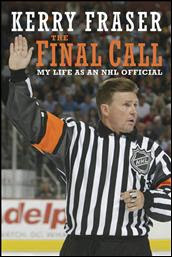 His autobiography Final Call: My Life as an NHL Official hits the stores in October 2010. Fraser talks about the famous "missed call" when Gretzky infamously got away with high-sticking Doug Gilmour in Toronto. He talks about breaking out in hives before calling Game 7 of the Battle of Quebec in 1985, the death threat he once received in St. Louis and the Marty McSorley illegal-stick incident. And of course he talks about his famous hair, and the tragic day when the NHL forced all on-ice officials to wear a helmet. Fraser's book is a fun read, full of behind-the-scenes stories. Fraser must have enough stories to fill five books. After all, his career lasted 30 years and 2165 games. While books by hockey referees tend to be quite formulaic, the one twist I like about Fraser's text is the very human story he presents at times in the book. Early on he dedicates a chapter called NHL = No Home Life, a chapter about how life in the NHL is not as glamourus as everyone thinks. At the end of the book he openly struggles with leaving the game, finding a new identity and deciding what to do with the rest of his life. We often forget these guys are not that far from you or I, and anyone who has left a job after a long period of time can definitely relate to Fraser's dilemmas. What makes this book even more impressive Fraser wrote this book on his own, without the usual help from a guest writer (although the HB Fenn editorial team I'm sure). It is a really well written book, at times funny, at times thought provoking and always good storytelling. "After thirty years as an official in the National Hockey League, legendary referee Kerry Fraser has decided to hang up his skates and enjoy the game from the other side of the boards. Never shy about offering his opinion, nor afraid to step in and separate an on-ice fight, the 5ft 7inch Fraser is without question one of the most respected officials in today’s NHL. "Fraser entered officiating after recognizing that his size would limit his chances as a player. He was introduced to refereeing by Scotty Morrison, who told him that the game needs more officials with actual playing experience. Fraser responded immediately with a welcomed understanding of the game, and over the course of the almost two thousand NHL contests he oversaw, has shown himself to be an unbiased judge. "In The Final Call, Fraser uses the seventy-two games he is officiating in his farewell season as the centre piece of his story. He relives candid memories from each city he visits, such as the night he was pulled from the ice by the Boston police after a threat was made that if he skated out for the second period he would be shot. Fraser offers a colourful, behind-the-scenes portrait of our national game, recounting stories of pulling apart enraged 250lb men in on-ice battles, and divulging the politics behind which games are assigned to which refs. Fraser discusses his colleagues as only an insider can, talking candidly about his relationship with the NHL and why he hasn’t been given a play-off game in years. "Although a referee’s story may not seem as glamorous as that of a star player, it is every bit as entertaining!"